Waiting on Wednesday is a weekly meme hosted by Jill at Breaking The Spine to spotlight upcoming book releases that we're excited about. William Darcy is obsessed with his ancestors. So much so that he intends to rebuild Pemberley (destroyed during the Uprising) stone by stone, and he wants to employ reconstruction expert Seraphene Grant to help him. Or does he? Seraphene wasn’t born yesterday. She can smell a rat, particularly when it stinks all the way up to her airship. She knows Darcy is hiding something. But with the Authorities after her and her other options dwindling by the moment, the temptation of genuine English tea and a gorgeous Steampunk gentleman are very difficult to resist. But what if Darcy’s mystery job courts nothing but trouble? What if Darcy is harboring a secret to kill for? When kiss comes to shove, will Darcy’s secret destroy Seraphene, or will it be her salvation? Join us on a romantic adventure like no other in this whimsical Pride and Prejudice-inspired tribute, featuring Wickham, Georgiana, dirigibles, funky fish, and swash-buckling pirates. 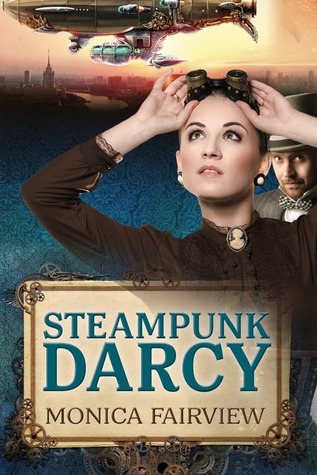 Have you heard of Steampunk Darcy? And what are you spotlighting this Wednesday? This does sound like a fun read. Gotta love a book with a Mr. Darcy! Sorry -- had an error in my previous post so re-posting. Thank you, Shelfspace Needed, for posting the book, and thanks, Kacii, Micheline D, Elin and Angela for your comments"